The Pseudomotor Faggi built for Moto Guzzi, This is actually a "fake" moped. The engine is only an air pump that makes noise. 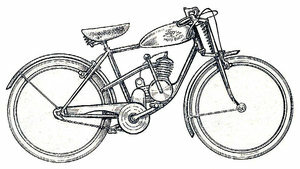 Faggi was a manufacturer of motorized moped Jlo of 125 and 175 and Villiers 125 and 198cc, with options of three or four speeds. The same engines are mounted on Motofurgoncini. Power is 6hp at 6,500rpm. There were three speed commands at the foot switch and the clutch ran dry. The frame is a double cradle, with sliding rear suspension fork at paralelogramme sheet. The advertised speed is 30km/h, which is not inferior to that of a good 125cc and is due to the high specific power mentioned above.